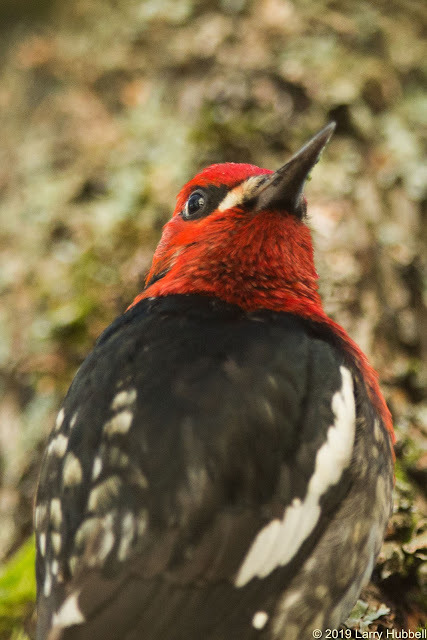 Red-breasted Sapsuckers are brilliant and beautiful. 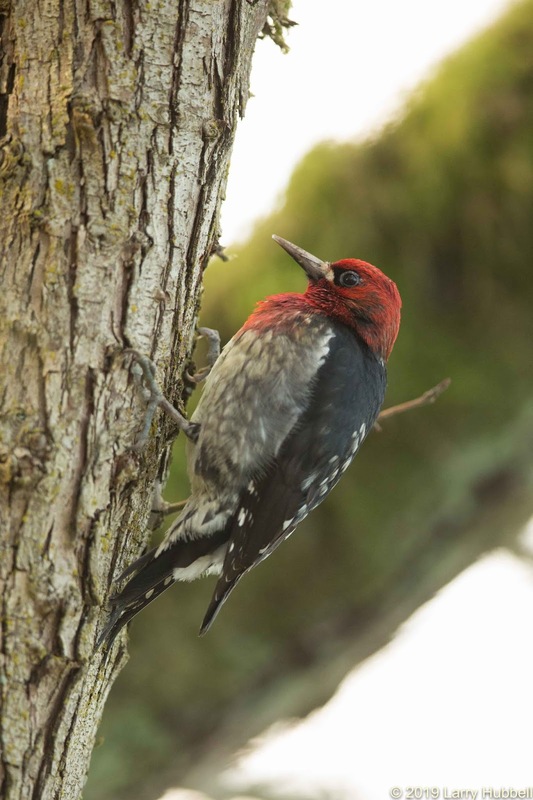 They are also unique when compared with our other species of local woodpeckers. The others feed mostly on arthropods, e.g. ants, and fruit. Sapsuckers, as their name explains, have a preference for the sweet lifeblood of trees. Although, they also eat ants, spiders, and fruit, especially during breeding season. Birds of North America says, they will even dip ants in sap before feeding them to their young. The young need the protein, and apparently, the adults want to make sure that the little ones also develop a taste for their primary winter food. Their deeper sap wells are usually aligned in horizontal rows which make it easy for them to reach to their left or right without significantly relocating. Their long stiff tails help to support their weight while they work. In the winter, sapsuckers, often pick a tree or two and continually return to the same sets of wells. At a casual glance, one might consider them the couch potatoes of the woodpecker world. Actually, I see them as hard working and industrious, maybe even wise and efficient. Their wells require an initial investment in excavation, plus ongoing maintenance to keep the sugary sap flowing. By working the same sites repeatedly, day after day, they are maximizing their ROI, e.g. the return on their investment. 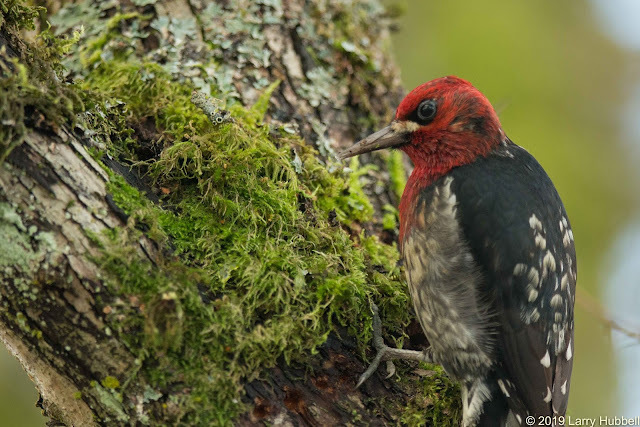 While Red-breasted Sapsuckers are fairly unique among local woodpeckers, there are two closely related species farther to the east. 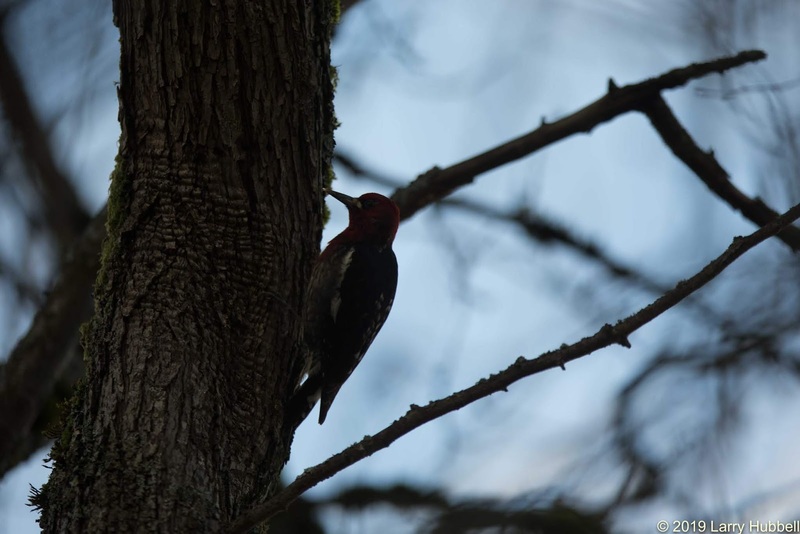 Red-naped Sapsuckers, like the one in this photo, are usually seen east of the Cascade crest. 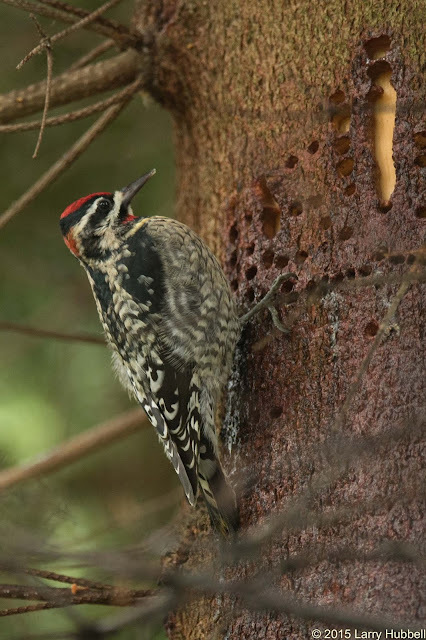 East of the Rockies, Yellow-bellied Sapsuckers are more common. These three species are similar enough that interbreeding occurs in places where the three species converge - like British Columbia. Historically, they were even considered a single species. In the Southwest, the Red-breasted Sapsuckers often have more of a white malar stripe. 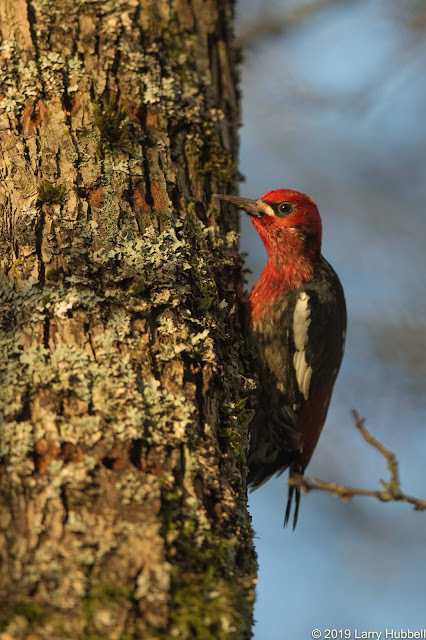 I believe the stripe is similar to the one seen on this Sapsucker. The stripe looks like an extension of the white spot just in front of the eye. 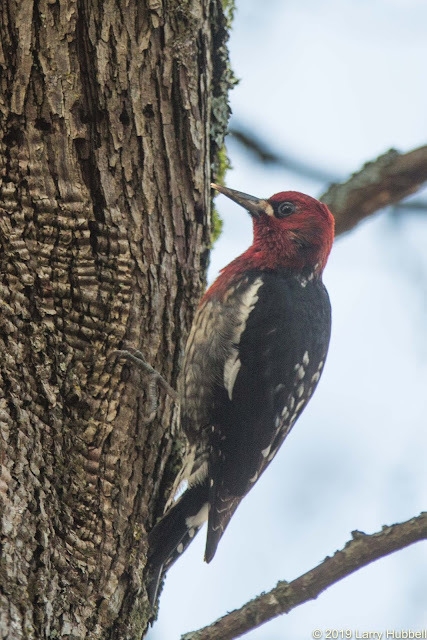 I wonder if the stripe might be an artifact of interbreeding between the Red-breasted and the Red-naped Sapsuckers. From what I have read, juvenile sapsuckers of all species are darker in color and initially lack any red feathers. I am looking forward to someday getting the chance to photograph one of the young birds. 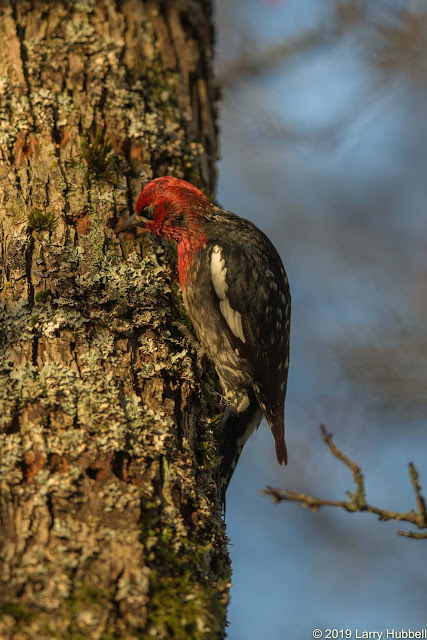 Similar to a Pileated Woodpecker, when a sapsucker spots a potentially dangerous creature the bird will generally move to the far side of the trunk and freeze. Sometimes, they peak around the tree to keep an eye on the intruder, but they seldom resume any noisy excavations until after they decide the threat is passed. 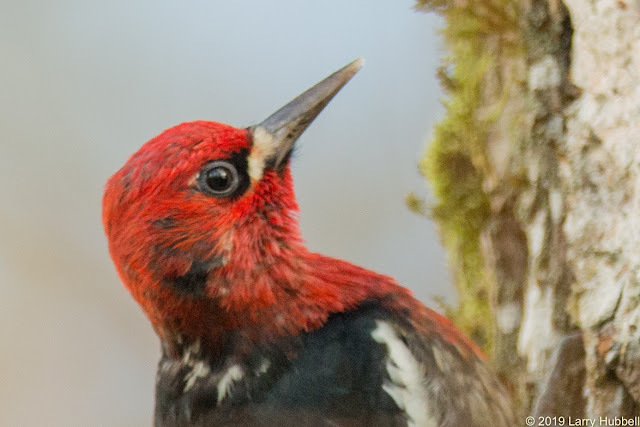 Compared to our Flickers, Pileated or Downy Woodpeckers, Red-breasted Sapsuckers have a higher percentage of bright red feathers. Our local red-shafted, Northern Flickers do have more orange-red feathers. 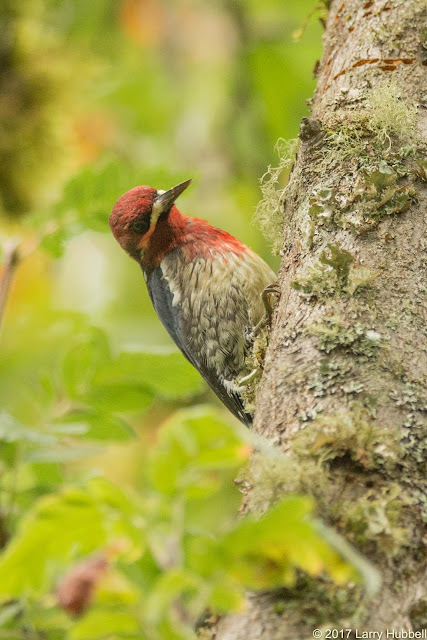 However, the Red-breasted Sapsuckers have more distinctly red feathers. 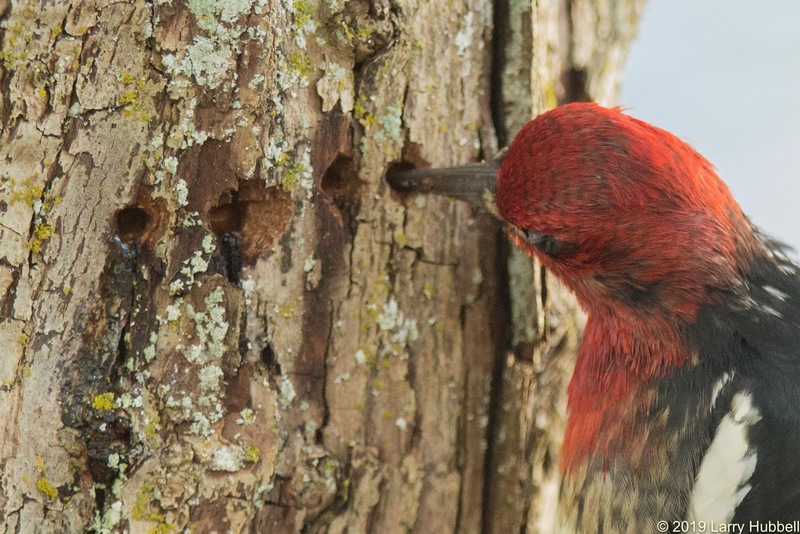 In spite of their brilliant color, I find the sapsuckers harder to spot than the previous three woodpecker species. I think this is because they generally work in the shadows, next to the trunk of the tree, Maybe also because they spend less time flying about from one location to the next. 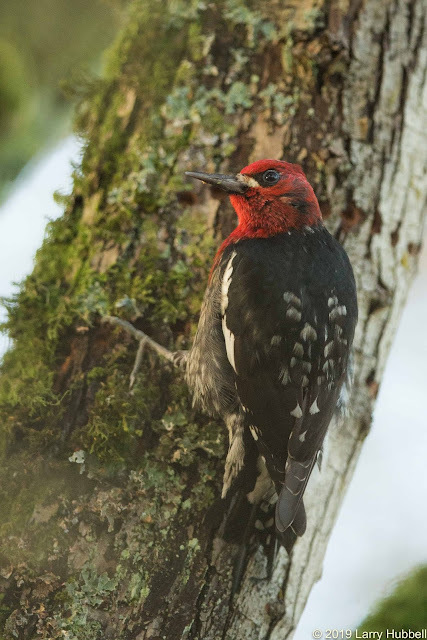 Here is a fairly common winter view of a Red-breasted sapsucker. In fact, they are often more distant than this photo implies and usually not outlined against the sky. Only with a careful adjustment of exposure does the beauty of the bird emerge. One of the most intriguing things about this species is the translucent tip to the bill. It is not always visible but I normally see it in at least a few photos from every encounter. I suspect it a matter of catching the light just right. Maybe it is similar to shining a flashlight through your fingernails. The luminous glow and its obvious strength on impact remind me more of ivory than fingernails. Another interesting item of note is how they can adjust their wings to hide their bright white wing stripe. If you look back through the photos you will see that it is sometimes displayed and sometimes not. I wonder if hiding the stripe is intentional or accidental? 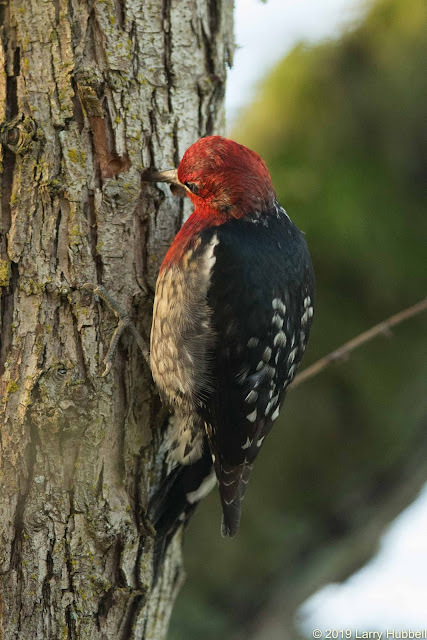 Speaking of catching the light just right, I feel very lucky whenever a Red-breasted Sapsucker peeks out of the shadows and catches one of our occasional shafts of sunlight. The result is a flaming explosion of brilliance. What species is this? 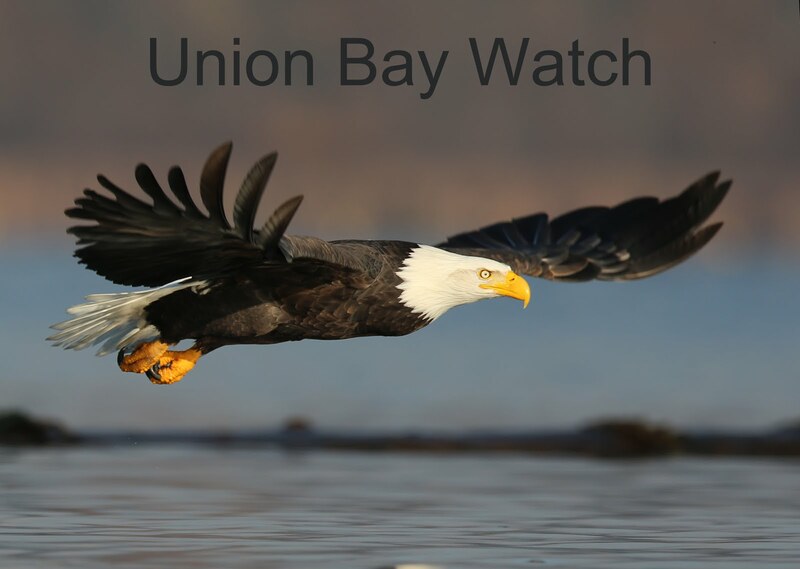 Is it native to Union Bay? Pacific Wren: Often hidden and small but definitely native to Union Bay. Thanks for shining a light on a usually unseen species. Thank you! It is great to hear from you. I hope your studies are going well! We used to have a lot more Red-breasted Sapsuckers in our neighborhood, 35-50 years ago. When the houses got more dense and closer to the creek the sightings were less frequent. 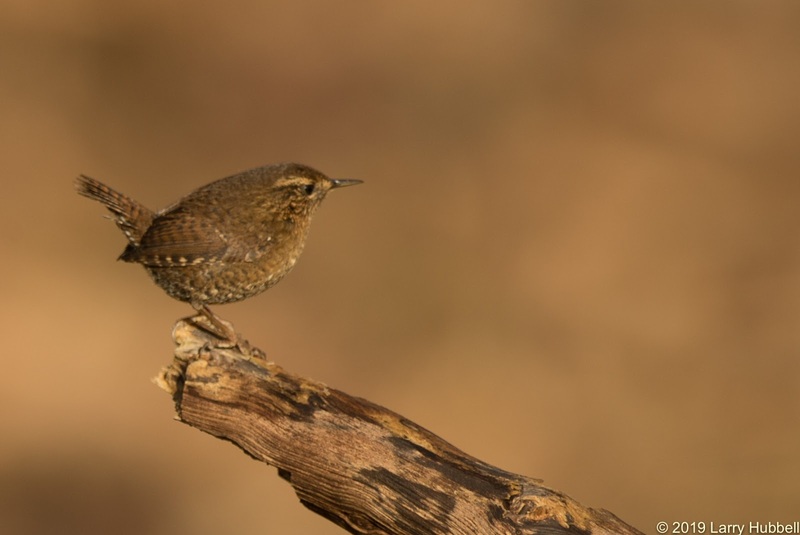 Usually the Pacific Wren stay close to the creeks. However, since the homeless started camping all along the wooded creek way, these shy birds are now seen more frequently feeding on the mature conifer trees around my house. I believe sapsuckers like the thinner bark of less mature trees. My friend Marcus specifically mentioned young Western Red Cedars. In the Arboretum the sapsuckers often work on coniferous trees from North Africa or Southern Europe. In the native environment of those trees there are no sapsuckers. Maybe as a result they have thinner bark. I am thinking planting young trees might help to encourage the return of your sapsuckers. Good Luck!